Back when I held the battle of the blenders, I kind of had a blender in mind and the response about the blenders confirmed my first choice. 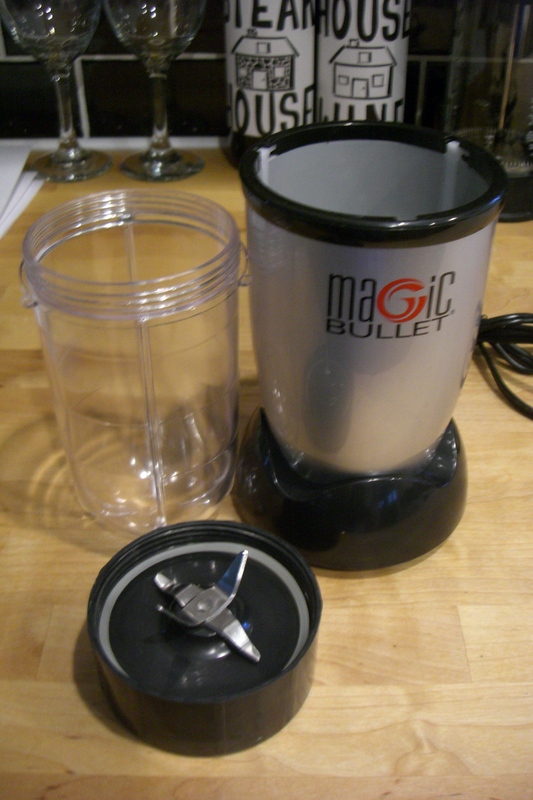 I went ahead with the Magic Bullet and let me tell you – it has been amazing. CSN allowed me to pick a product to try out so that is where my Magic Bullet came from. They sell kitchen tables, kitchen gadgets, outdoor items and really anything you can think of. I was excited to pick an item to review and super happy to see it in their personal blender selection. The Magic Bullet came with 6 different cups (1 large, 1 small and 4 large travel cups), 2 blades, a shaker top, 2 sealable tops and base that plugs in. My favorite part about the Magic Bullet is that it takes up so little space and is easy to clean. My regular blender is pretty big and works great, but it always seemed like such a hassle to get it out of the cupboard, use it then clean it. With the Magic Bullet I can actually use it every day if I want to because the blades are quick to hand wash and the cups I just throw in the dish washer. If the one I used isn’t clean, I just choose from another one of the six I have. Of course I have been making a ton of smoothies with it, but I have used it for other things too. Pancakes have become even quicker in the morning now. 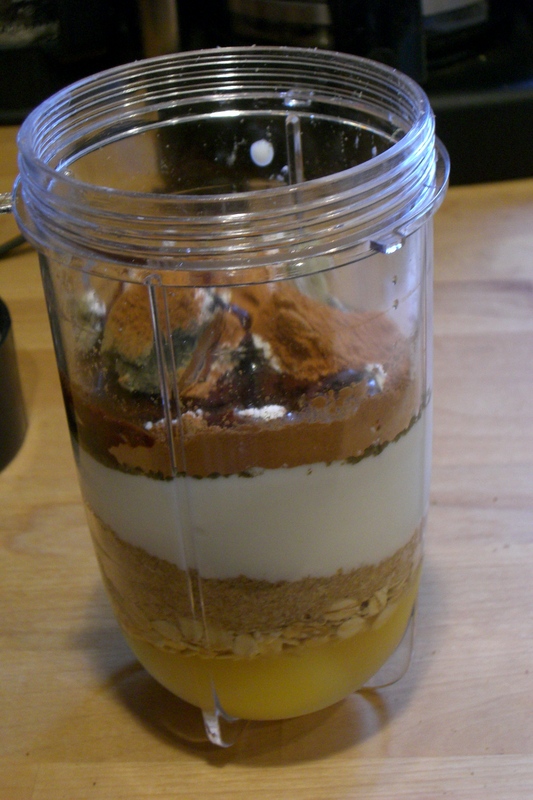 Combine all ingredients in a large magic bullet cup (or your blender or food processor). Pulse until all ingredients are combined. Heat your skillet to medium heat and coat with olive oil spray. 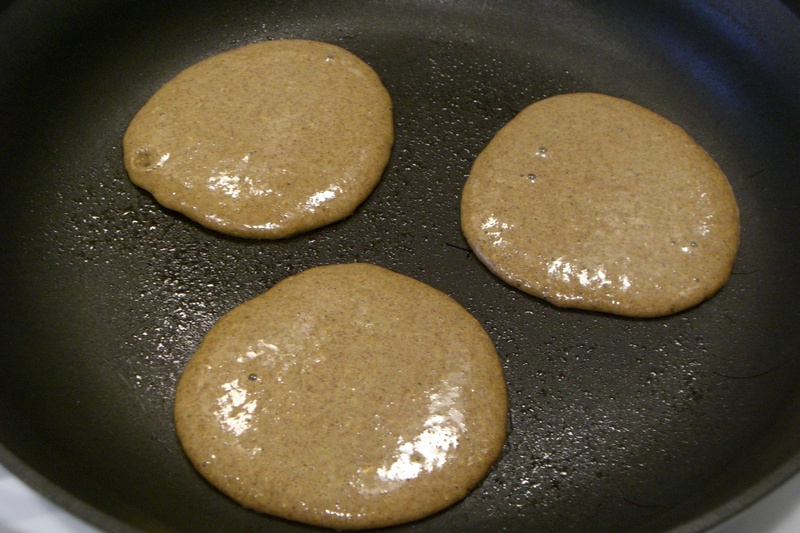 After letting the mixture sit and thicken for 5 minutes, pour the batter into pancakes (about 1/4 – 1/3 cup) 3 or 4 at a time. Let it cook on one side for a few minutes until you see bubbles forming on the top. Flip and cook on the other side for a few minutes then repeat with remaining mixture. You should end with 8 pancakes. Top with maple syrup if you want, or apple sauce and almond butter like I did! CSN wants to give away a $40 shopping spree to one lucky reader! Please share your favorite pancake recipe (links are great) to enter. For additional entries link this giveaway back on your site. I will randmonly pick a winner one week from now on Thursday, September 9th. I love these dieter’s dream pancakes.. low cal, low carb, high protein! They’re from Foods of April’s blog – http://foodsofapril.com/?p=5294. I make them all the time with pumpkin and applesauce for some variations! That girl knows her stuff! as far as boxed pancakes go, i love lehi roller mills! I still use your mom’s buttermilk pancake recipe all the time! A magic bullet is on the top of my list! I, like you, don’t use my blender all that often because it is such a hassle to get out and clean,etc. YUMMM!! i love making pancakes with my bullet! Top with blueberries and syrup!! Oh my goodness… I keep my favorite pancake recipe bookmarked so I can quickly pull it up! Surprised I don’t have it memorized by now….